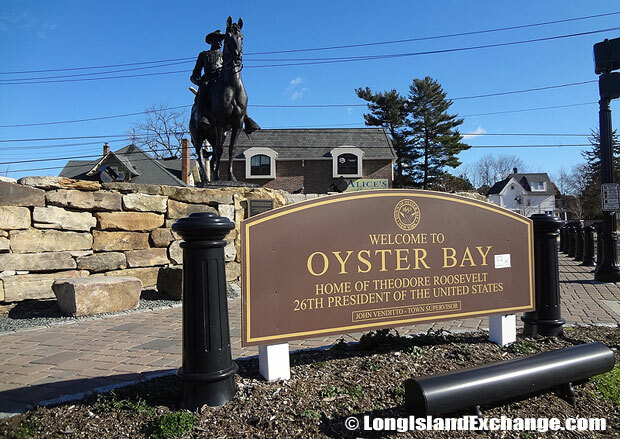 Oyster Bay is a hamlet and census-designated place located in Nassau County, on the north shore of Long Island, New York. It is within the Town of Oyster Bay which contains 18 villages and 18 hamlets. Oyster Bay is only 45 miles from New York City. As of the 2010 census, there were 6,707 people, 2,552 households, and 1,567 families residing in the area. The median income for a household in the area was $74,811 and the median income for a family was $104,917. Males had a median income of $64,306 and just $47,417 for females. The latitude of Oyster Bay is 40.865N. The longitude is -73.532W. It is in the Eastern Standard time zone. Elevation is 180 feet. The above data is for the hamlet of Oyster Bay. As of the 2010 census, the entire town population was 293,214. The city center and welcome area features a statue of Theodore Roosevelt, the 26th President of the United States, and a notable historic Long Island resident. 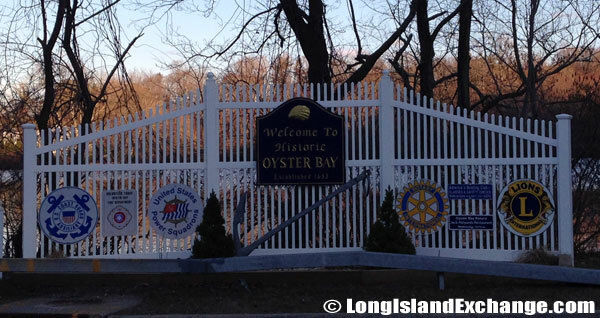 A small fence welcomes visitors and residents to the Historic area of Oyster Bay, first established in 1653. 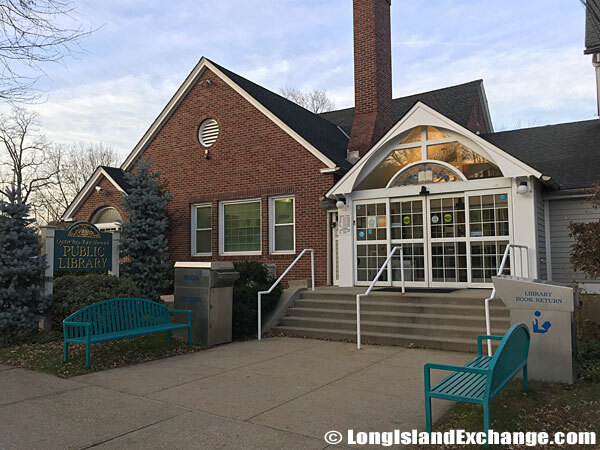 The Oyster Bay-East Norwich Library on Main Street in Oyster Bay, about a mile west of Oyster Bay Cove.. In 1653, English under Peter Wright first settled in the area. It was originally discovered by the Dutch which was the boundary between the Dutch New Amsterdam colony and the English New England Colonies. Other settlers include Samuel Mayo and the Rev. William Leverich came from Cape Cod and settled near Oyster Bay Harbor. They bought a land from the Matinecock Indians that extended down into today’s Hicksville. During the colonial era, the area was known as a smuggling place. Ships would bring in regular trade goods but avoid paying custom duties on them. In the late 1800s, many establishments were developed and several boarding houses and hotels were erected near the water including the Trout Pond Inn. 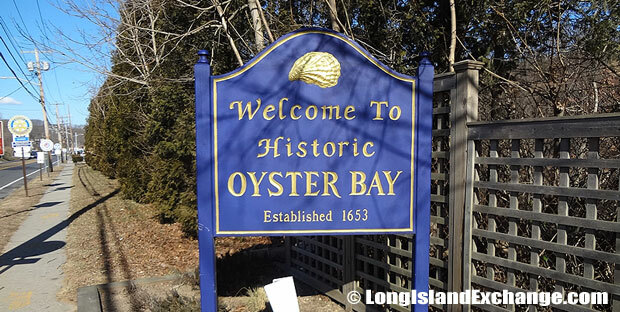 A sign welcomes visitors and residents to the Historic area of Oyster Bay, first established in 1653. 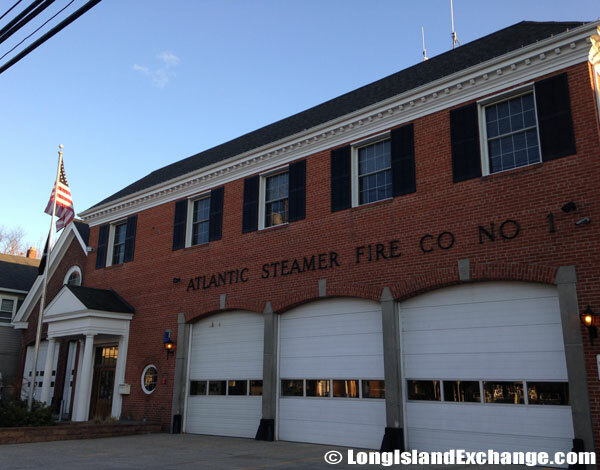 The Atlantic Steamer Fire Company, Number 1. Oyster Bay Fire Department, South Street and Irving Place. The area has been a home of many famous residents which include Theodore Roosevelt (the 26th President of the United States), Billy Joel (former musician), John McEnroe (tennis player), Heather Matarazzo (actress), and Lee Ranaldo (guitarist). Some of them attended in Oyster Bay High School. 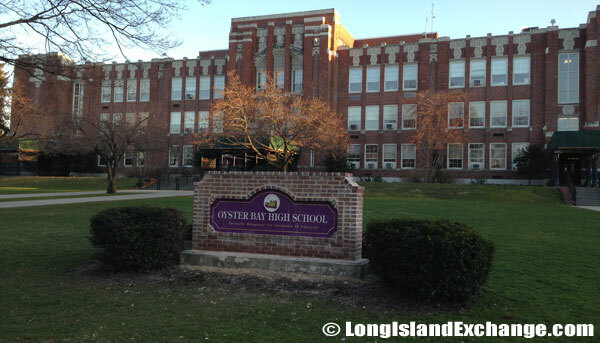 The Oyster Bay-East Norwich Central School District serves the entire hamlet of Oyster Bay and East Norwich which also includes the incorporated villages of Centre Island, Oyster Bay Cove, Cove Neck, and portions of Mill Neck, Muttontown, Laurel Hollow, and Upper Brookville. 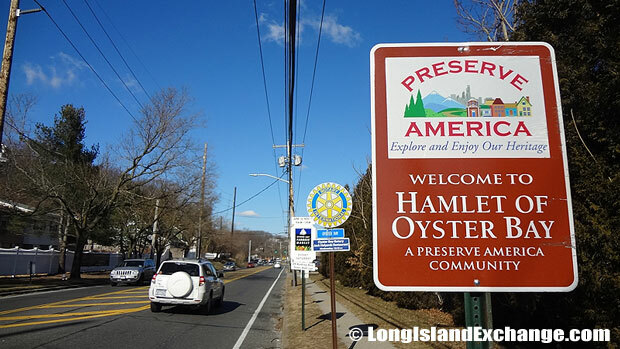 A sign welcomes visitors and residents to the Hamlet of Oyster Bay, a Preserve America Community, a White House initiative to encourage and support community efforts for the preservation and enjoyment of history. 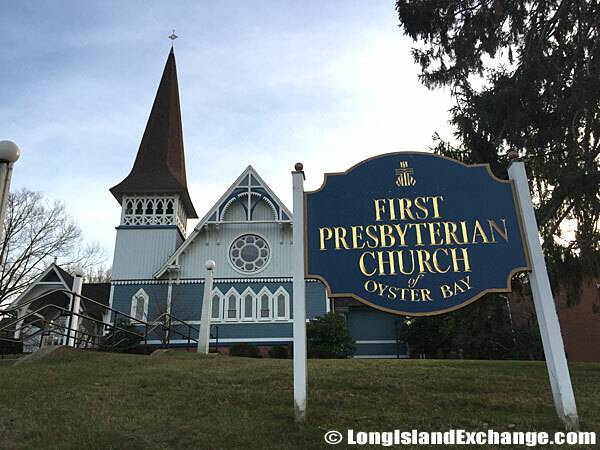 The Historic First Presbyterian Church built in 1873 at 60 East Main Street in Oyster Bay. 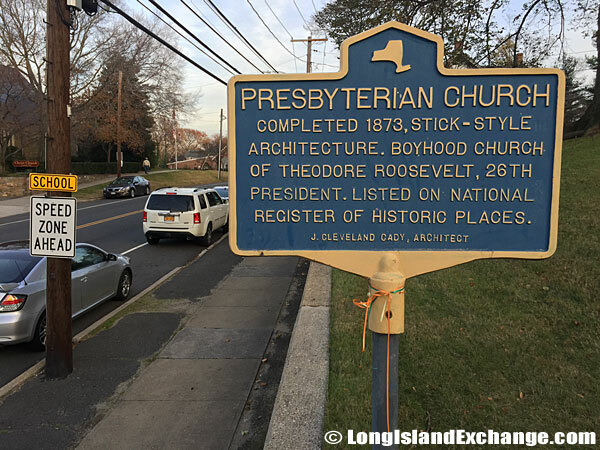 Historical marker for the First Presbyterian Church, the boyhood church of Theodore Roosevelt. The Sagamore Hill was the historic home of late President Theodore Roosevelt. The Congress established Sagamore Hill National Historic Site to preserve the house as a unit of the National Park Service. The house is open to the public by guided tour, and almost all the furnishings are still original. The other attraction at the site is the Theodore Roosevelt Museum which records the life and career of the President. The WaterFront Center is also one of the famous attractions which offers learn-to-sail students a protected and scenic place to start. 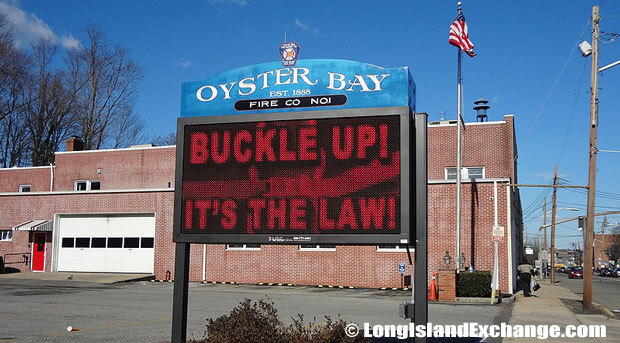 The Oyster Bay Fire Department sign reminds area drivers to ‘Buckle Up’, it’s the law. 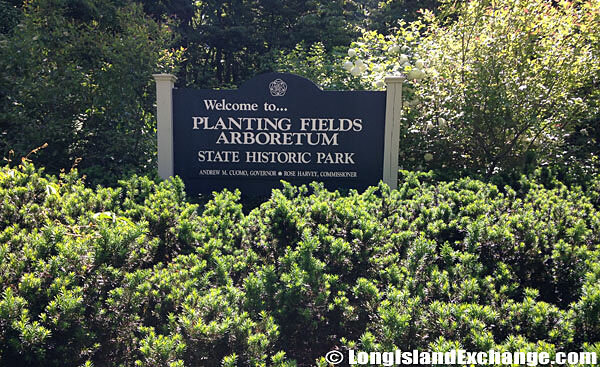 The 406-acre Planting Fields Arboretum State Historic Park is located in Oyster Bay. 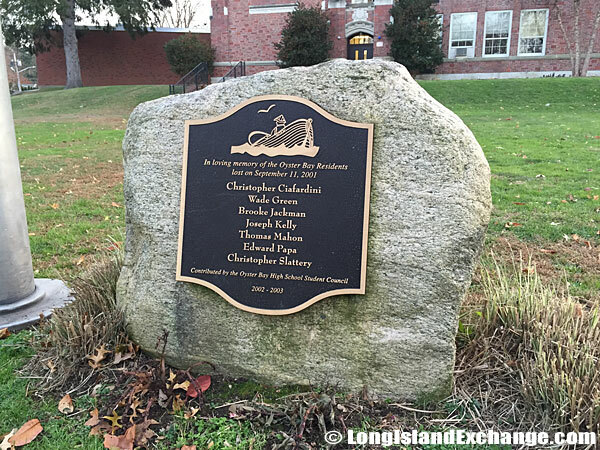 A commemorative plaque outside the Oyster Bay High School. The community is strictly implementing laws to protect their natural resources which has a 3,200 acre National Wildlife Refuge and is considered “Significant Coastal Fish and Wildlife Habitat”. 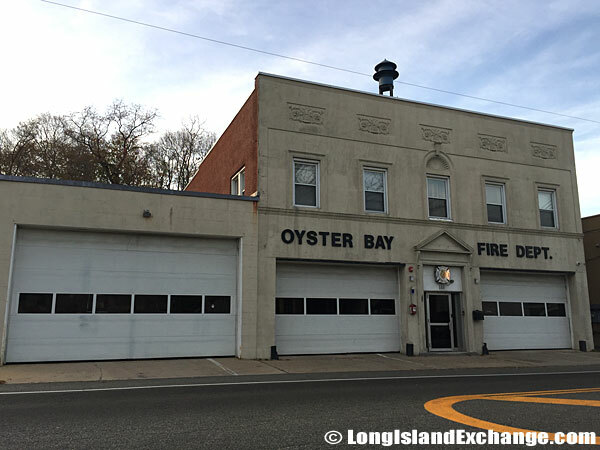 The Oyster Bay Fire Department serves the people of Oyster Bay, Oyster Bay Cove, Cove Neck, parts of Mill Neck and Laurel Hollow. 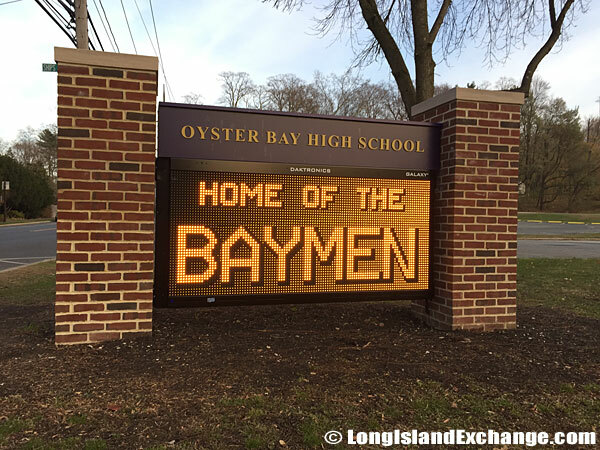 Oyster Bay High School digital sign reads, home of the Baymen. Oyster Bay, a historic town, is rich with history from 19th century Baymen who worked the waters.